We’ve had such a positive response to our #whereiwork, workplace location survey with almost 300 responses! The survey was designed to find out what’s important to UK workers when they’re looking for a job and we’ve got some interesting statistics. 44% of people would choose a job location over the job itself. Two thirds of people agree that ‘Ease of Commute’ is the most important factor about their office location. 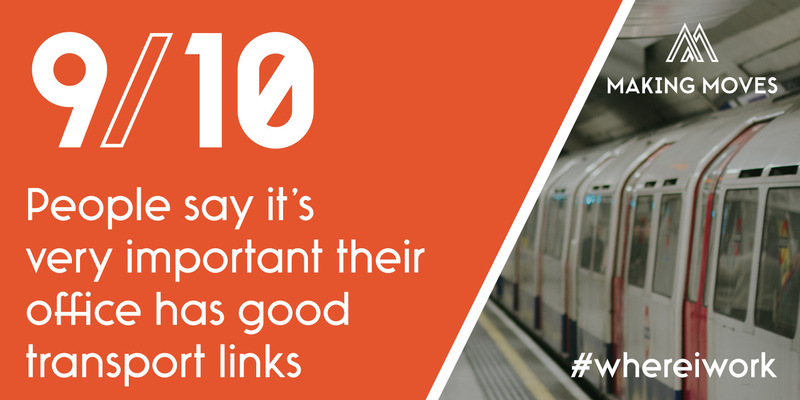 9/10 people agree that their commute to work affects their mental wellbeing. Only 1/5 people are willing to commute 75 minutes or more to work. To win: A £50 Selfridge’s voucher. The promoter is Making Moves London Ltd. The competition is open to residents of the United Kingdom aged 18 years or over. Route to entry for the competition and details of how to enter are outlined above. Only one entry will be accepted per person. Multiple entries from the same person will be disqualified. Closing date for entry will be 30.06.18. No responsibility can be accepted for entries not received for whatever reason. Winners will be chosen by Making Moves London Ltd. The winner will be contacted via email on 02.07.18. The promoter will notify the winner when and where the prize will be delivered. Entry into the competition will be deemed as acceptance of these terms and conditions. This promotion is in no way sponsored, endorsed or administered by, or associated with, Instagram, Twitter or any other Social Network.